The latest bands CD is now available for purchase at £10 per CD or £12 including postage. 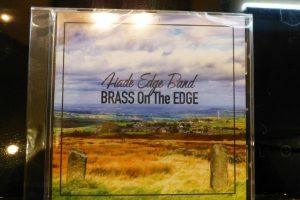 The CD was recorded at Hade Edge Band Room in October 2017 and released in December 2017 ready for the bands 110th anniversary year celebrations in 2018. Contact Robert on 07512 600602 if you wish to purchase a copy, or speak to any band or committee member who will be pleased to assist you in your purchase. 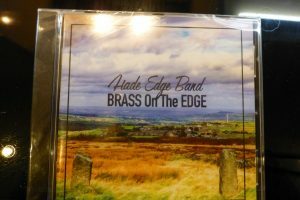 2008 was a year to remember at Hade Edge – the band celebrating 100 years of banding based in the village. The band celebrated their 100 years of existence with a concert in Huddersfield Town Hall in July of that year. The concert was a “free” concert for all, and of course as expected the Town Hall was full. The audience were entertained by not only the Senior Band whose birthday it truly was, but the Training band, Junior band, Jazz band and Community Choir along with our guest soloist for the evening – David Childs- euphonium player with Cory Band. A commemorative programme was produced and a Senior Band CD produced called Up the Old Stone Steps a reference to the old band room entrance.